Over the years, E3 has produced numerous activity booklets, field guides and other print publications. Our activity booklets have been distributed to hundreds of thousands of Arizona elementary and middle school students and adults on topics including water conservation, wildlife, and desert ecology. Year after year, E3 develops new visual styles, activities, and themes to make our print publications educational and engaging. E3 has developed two guidebooks, one for 6th-8th graders and the other for adults, about Sweetwater Wetlands, a natural laboratory where visitors can observe and study wildlife, water resources, and riparian natural history. Both books include background information, as well as a field guide to common plants and animals of Sweetwater Wetlands. The student book also includes a variety of activities to be completed at the Sweetwater Wetlands or in the classroom. Stormwater in the Desert: A Middle School Activity Book is designed to educate 6th-8th grade students about stormwater, weather, watersheds, and other science and engineering topics. In addition to classroom and home activities, students can venture into cyberspace with web-interactive stormwater games, exercises and links to useful websites. This curriculum can help teachers meet ADE standards through a variety of relevant, hands-on activities. Stormwater in the Desert is sponsored by STormwater Outreach for Regional Municipalities (STORM) in Central Arizona. 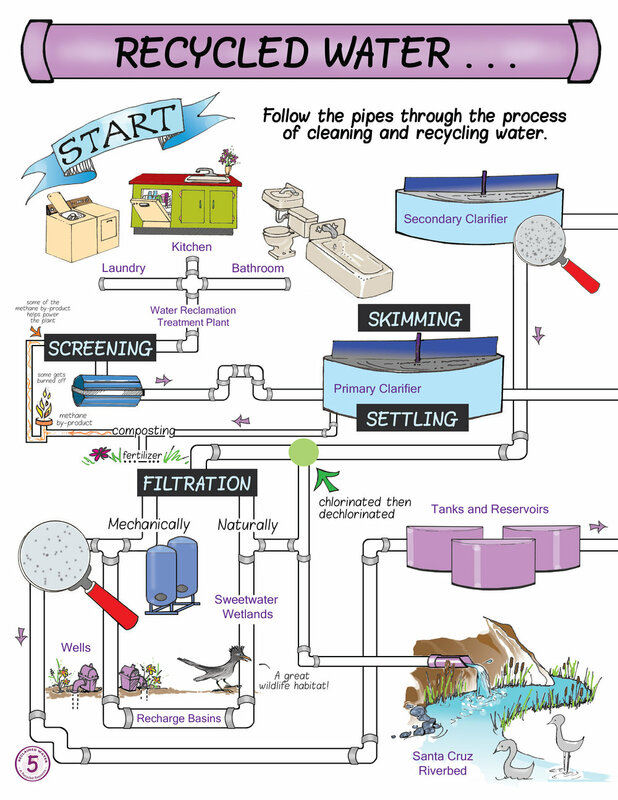 Since 1995, E3 has developed an informal children’s activity booklet focusing on water conservation and how to be “water smart.” Originally called Beat the Peak and produced annually, the booklet is now called Water Smart with new versions created every few years. Each booklet has a distinct theme, featuring "Pete the Beak," a savvy duck who spreads the word about water conservation, taking on guises ranging from super hero to pirate to politician. Sponsored by Tucson Water, each 12-page booklet is packed with fun activities, including crossword puzzles and other word games, mazes, graphic puzzles, card sets, drawing or cut-out activities, and more. Since 1995, over 100,000 of these booklets have been distributed to students in Tucson. 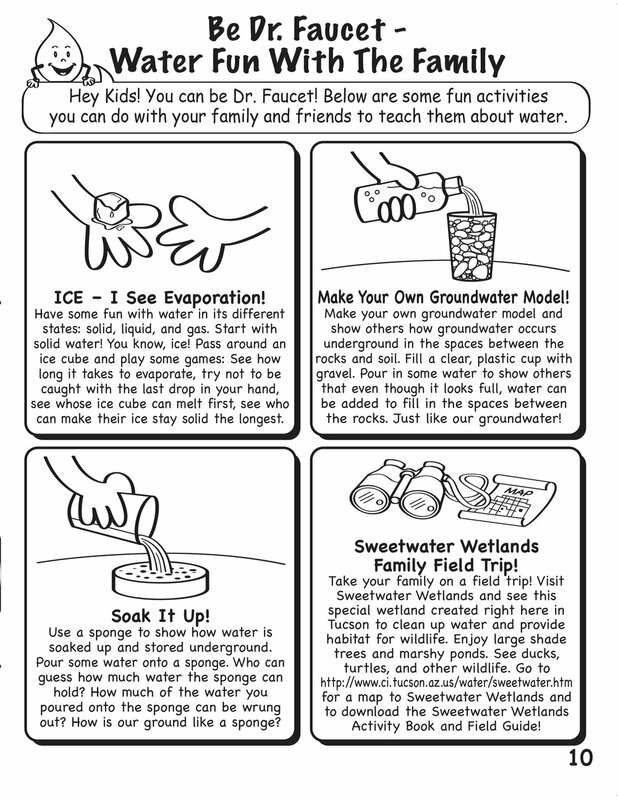 Da Drops and Water Smart Kids is an activity booklet for 1st-3rd grade students participating in the Da Drops classroom presentation. 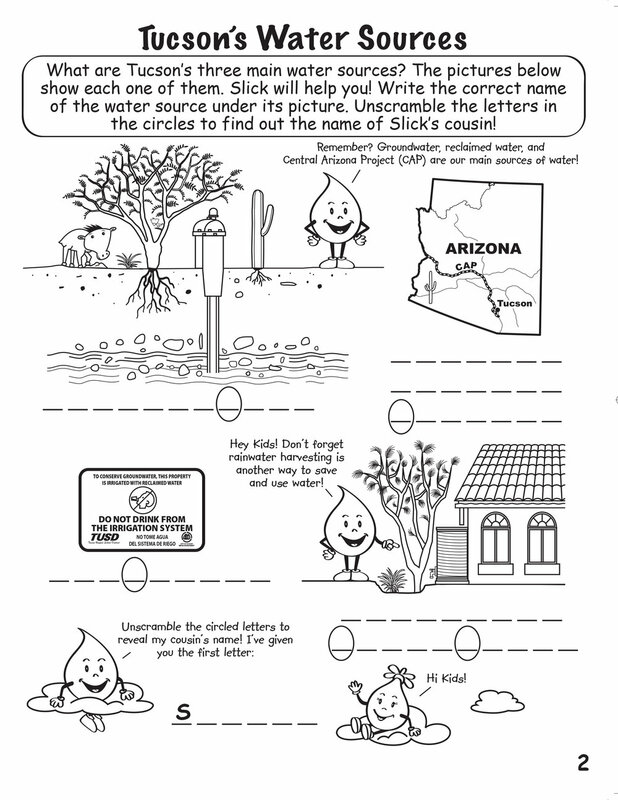 Students learn about the water cycle, water supply, and water conservation in the Tucson Basin during the presentation, and take home this booklet of fun and exciting word games, puzzles, activities, and coloring pages to reinforce newly acquired understandings. The booklet, presentation, and related activities are aligned with ADE standards. Da Drops is sponsored by Tucson Water and offered free of charge to Tucson-area schools. Our Water, Our Future is an activity booklet for 4th-5th grade students participating in the Our Water, Our Future water education program. Students learn about natural and urban water cycles, Tucson's water supply, water as a limited resource, water use, water recycling, and water conservation, and take home this engaging full-color booklet of word games, puzzles, mazes, and more to follow up on their learning. The booklet, presentation, and related lessons are aligned with ADE standards. Our Water, Our Future is sponsored by Tucson Water and offered free of charge to Tucson-area schools. Land of Black Volcanoes and White Sands is a book describing the geology, plants, animals, and human history of the Pinacate and Gran Desierto de Altar Biosphere Preserve, located in the Sonoran Desert along the US-Mexico Border. Full-color photos and maps enhance the detailed text. Invasive Plants of the Sonoran Desert is a field guide developed in partnership with the Sonoran Institute, Tucson, Arizona. The field guide is intended to assist land managers, homeowners, ranchers, educators, students, and others identify non-native, invasive plant species found in the Sonoran Desert and associated riparian areas. On the Air: Exploring Air Pollution Sources and Solutions is an interactive teaching kit developed specifically for 6th grade students in Washington DC, Virginia, and Maryland. The On the Air curriculum facilitates the understanding of air pollution by studying air pollutants, the Air Quality Index, ozone, particulate matter, the health effects of air pollution, community sources and solutions, and climate change. Each of the seven units consists of teacher lesson plans, student worksheets, and kit materials. Lessons are aligned with educational standards in Washington, DC; Virginia; and Maryland. The On the Air teaching kit and curriculum was developed for Clean Air Partners, Metropolitan Council of Governments, Washington DC.